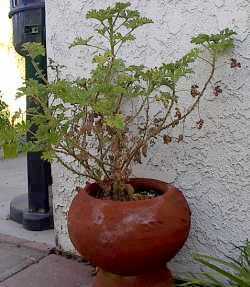 At this time of year, a typical scented geranium is looking kind of rough. It is leggy and unkempt. Now is the time to take all the cuttings you can stand. Now cut back as seriously as you can. I like to leave some new growth for good luck. 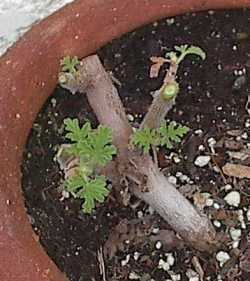 This severe pruning seems harsh, but it accomplishes a lot of good for the plant. When the older, stressed growth is removed, along with it goes disease and pests. All nutrients will be focused on the new growth. Pay attention for any sign of stem rot. If so, try to cut it out and be sure to sanitize your knife or scissors before moving on to another plant. Start some cuttings as a back up. Add a little fresh potting soil to replace any that has washed out over time. Water with manure tea or Miracle Gro – your preference.